A Devon city shopping centre criticised for its architecture has won a major award from the retail industry. 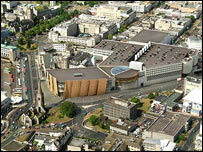 Plymouth's Drake Circus centre has been voted Britain's Shopping Location of the Year by Retail Week magazine. The judges said it would not win many architecture prizes, but added it had reinvigorated the city by drawing people from across Devon and Cornwall. The £200m mall, which has about 654,000 sq-ft of floor space in a 6.5-acre site, opened last October. Managers hope the mall will attract 15m visitors a year. More than 300,000 shoppers came in its first four days. Recently the newspaper Building Design awarded the Plymouth centre its Carbuncle Cup for its design. It was also criticised as "inexcusable" by Plymouth University's professor of architecture, Jeremy Gould, and architect David Mackay, who came up with a blueprint for the future of the city. But the Location of the Year accolade meant it had received similar praise as that given to previous winners, including Bluewater in Kent and the Bullring in Birmingham.